Android may be the most popular mobile browser, having today overtaken Opera, but when it comes to HTML5 performance, it looks like iOS is king. This at least according to a new report from spaceport.io, which claims to be the “first-ever report on the technology’s performance on top smartphone and tablet platforms”. And it’s about time. With Facebook and major carriers and OEMs backing it, HTML5 has been gaining ground as a viable technology to support rich mobile apps on many of today’s most popular platforms. Interestingly, many had surmised that HTML5 might throw a wrench in Apple’s quest to become the dominant mobile platform, but spaceport’s “PerfMarks report” showed that iOS devices and browsers (iPhone, iPad, and Safari) outperformed its Android competitors across the board when it came to rendering movement on-screen. Spaceport is looking to add to the HTML5 consortium’s movement to establish a series of objective benchmarks for judging HTML5 game performance across mobile operating systems in hopes of creating industry standards and giving developers a reliable litmus for performance across platforms. 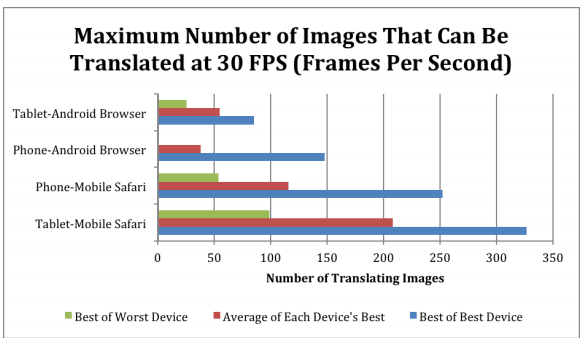 The company tested each device’s ability to support HTML5 games by analyzing image movement capabilities, first and foremost, measuring the number of moving images on a screen at 30 frames per second — a comparable rate to the native experience. Spaceport found that iOS devices like the iPhone 4S and the iPad 2 scored very high, handling over 200 moving objects and over 300 moving objects, respectively. And to that point, the iPad 2 ranked as the top device for HTML5 games and apps performance, beating out all Android devices across the board. According to the report, only the Android Galaxy Nexus was able to maintain more than one moving object on the screen (an average of about 100 images), while all other Android phones, like the Droid 2, for example, struggled to handle a single image at 30 frames-per-second. Unfortunately for Android, phones like the Droid 2 ranked below even the oldest iPhone tested, the 3GS, which handled 53 moving objects at 30 FPS. In all, the report concluded that both of the latest iterations of the two platforms, iOS 5.0 and Android 4.0 have “registered massive improvements,” 100 percent increases each, in image-movement capabilities since their last versions. And the bright side for Android, the report noted, is that Ice Cream Sandwich has made it a “much more viable environment for HTML5 development,” while Android 3.0 devices? Not so much. “HTML5 is getting faster over time, as seen in the latest OS updates across Android and iOS. Although this is a welcome trend, there is still a long way to go,” says spaceport.io founder Ben Savage. For more, check out spaceport.io at home here and find the hosted report here.